The arts at EMU: at left, student Alyse Yoder paints in a class. At right, Professor Margaret Martin Gehman, who continued to teach watercolor until 1996, suggests a vivid daub of orange to Elva Miller in this photo from the 1961 Shenandoah yearbook. 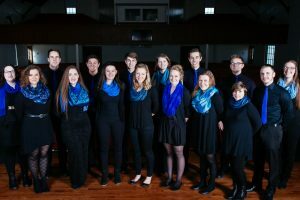 Students entering Eastern Mennonite University today may not realize that in their grandparents’ generations, this institution offered one music option: Singing, usually in four-part harmony, a cappella hymns only. For arts more broadly, until the late 20th century, many North American Mennonites limited the arts to purposes of functionality, as in hand-crafted quilts for beds or pottery to contain foodstuffs, or education, as in artistic creations with explicitly Christian themes. During mid-1960s through the 1970s – encompassing 15 years of great social change within Eastern Mennonite College and beyond – president and theologian Myron Augsburger BA ’55, BTh ’58, guided the institution from insularity into full acceptance of activities that undergird a liberal arts college, including art, instrumental music, drama and intercollegiate athletics. Now at EMU, students learn to study and use art transform the world, discover purpose, deepen faith, reach across generations and enter into healing spaces. This timeline of the arts at Eastern Mennonite was created by Randi B. Hagi ’15 and editor Lauren Jefferson. It was reviewed by professors Jerry Holsopple, John Fast, Joan Griffing, John Horst, Heidi Winters Vogel, Stephen Sachs and Barbra Graber, as well as by Gretchen Maust ’73. Noah D. Showalter joins the faculty as the first music teacher. He has a certificate from the American Normal School of Music in Harrisonburg, and had studied voice under renowned teacher J.D. Brunk. The first president, J. B. Smith, resigns because he has a piano in his home, which his oldest daughter plays. (Instrumental music was officially banned from Mennonite churches.) The Smith family returns to Ohio. He was replaced by A.D. Wenger, whose wife Anna May Wenger then gave up her pump organ in support, although she was later chastised for subsequently playing at someone else’s home. Mark Stauffer ’35, Juilliard-trained and a Madison College graduate, is the first full-time music instructor and first faculty member with a music degree. He expands offerings beyond the previously offered two courses, to appreciation, voice, introduction to music, history of music, church music, theory and choral conducting. Stauffer will lead choirs through the ’60s. The original farmer’s cottage, located near the current seminary building, is converted to EMC’s first art building. The Shenandoah staff of 1953. M.T. Brackbill, advisor. Clockwise from bottom left: Laban Peachey (editor-in-chief), Robert Witmer, Norman Kiser, Jay B. Landis, Milo Stahl, Miriam Pellman, Evelyn Rittenhouse, Ruth Nussbaum, Ruth Burkholder. The Phoenix, EMU’s literary and visual arts journal, is founded by Professor I.B. Horst ’39. Literature professor J. Herbert Martin ’59 serves as its first editor. A Festival of Fine Arts features plays, lectures on the arts, art displays and musical presentations. Jean Snyder sings at a 1963 Smithsonian Literary Society music program, accompanied by Helen Delp. “Rebirth,” a student group, releases their first album after first playing together during the 1969 Miracle Fund Drive for the new Hartzler Library. The group eventually went on two tours and in 2016, released a third and final album. Read more here. The EMU JAZZ, a big band ensemble and Swing Sisters, a female vocal ensemble, begin under the direction of Professor Stephen Sachs. Working with Ted Swartz ’89, M.Div ’92, Professor Barbra Graber ’76 co-founds and directs AKIMBO, an award-winning community-based professional theater with Mennonite themes and participants. The group continues until 1998. Members included Lee Eshleman ’86, Suzanne Kiblinger ’91 Kratz, Jeremy Frey ’92, Pamela Frey ’92, Rose Stauffer ’85, Ingrid DeSanctis ’88, Duane Sider, Nancy Good and Joy McIlvaine ’88. Professor Ken J. Nafziger leads the EMU Chamber Singers on a trip to Cuba along with Ysaye Maria Barnwell, a member of the renowned gospel group Sweet Honey in the Rock. From 1999 to 2003, when President Bill Clinton opened the doors to Cuba through education-centered travel permits, Nafziger made 11 music-centered trips. WMRA picks up the WEMC broadcast, retaining Mostly Mennonite, Mostly A Cappella, hosted by emeritus professor John Horst, from 8-9:30 a.m. Sundays (encore at 8 p.m. Wednesdays). Also retained is the Park View Mennonite Church worship services, from 9:30-10:30 a.m. 91.7 FM and online at wemcradio.org. Theater professor Heidi Winters Vogel and student Pam Mandigo ’08 found CrashHouse Collaborative Theater Project, a summer high school theater workshop. This program is supported by Arts Council of the Valley and EMU with students from area high schools. 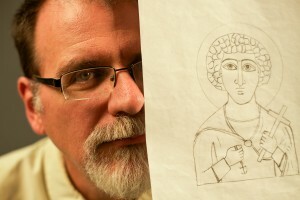 Professor Jerry Holsopple’s icons exhibit is the first in the new Margaret Martin Gehman Art Gallery. Phase II construction of the University Commons is completed, including the renovated 200-seat MainStage Theater, the relocated Lee Eshleman Studio Theater, the new Margaret Martin Gehman Art Gallery and the new Kenneth A. Longacre Sr. Advanced Media Lab. The facility is dedicated in the spring of 2011. The new Studio Theater space is dedicated to actor Lee Eshelman ’86, who also worked in the EMU print shop and as a graphic designer. Emulate, under the direction of Professor Ryan Keebaugh. 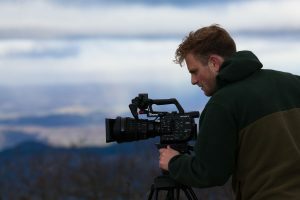 Macson McGuigan becomes EMU’s second North American Nature Photography Association College Scholar. “Guns into Plowshares,” a 400-ton sculpture by Esther Augsburger ’72 and son Michael ’80, is mounted at EMU after years of display in Washington D.C.
During Homecoming and Family Weekend, Ingrid De Sanctis ‘88 and Ted Swartz ’89, MACL ’92, are joined by alumni actors to debut What we bring. What we take. What we leave. The 10 x 10 x 100 Centennial Art Show, curated by Ashley Sauder Miller ’03, features six prominent alumni artists and their 100 works measuring 10 inches x 10 inches. A percentage of the sales will be donated to the EMU arts program.